Nathan is implementing the USAID-funded Moldova Structural Reform Program, a four-year project that aims to strengthen Moldova’s business and trade enabling environment through a flexible, demand-driven approach, in consultation with key Government of Moldova counterparts, including the Ministry of Economy, Financial Market Regulators, the Customs Service, and others. By working with a wide range of stakeholders, Nathan is expected to contribute to improvements in policies, regulations, institutions, and processes that can help lead to sustained and inclusive economic growth in Moldova. From left to right: Karen Hilliard (Mission Director, USAID/Moldova), Douglas Muir (Chief of Party, MSRP), Chiril Gaburici (Minister of Economy and Infrastructure), and H.E. James D. Pettit (U.S. 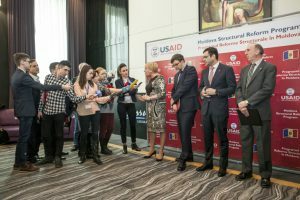 Ambassador to Moldova) address reporters at the Launching Ceremony in Chisinau for the USAID Moldova Structural Reform Program. (4) Establishing and managing a trade corridor enhancement fund. Across all of these Project components, Nathan emphasizes cutting red tape and developing a fair and less corrupt regulatory system that utilizes improvements in information technology and web-based applications.